Nobody spotted the *ahem* "deliberate" mistake I made with the last release of War of the Solstice - I updated the textual list of changes on the Market, but completely failed to update the APK file to 1.3! In fact, I'd uploaded it to the developer's console, but didn't press the right combination of buttons to get it to actually go live. This is the danger of testing via side-loading - I never check that the actual version on the market is what I expect. It's all too much like hard work. Fixed it now though. I've added an example to the android-ndk-profiler project based on the native-activity from Google's Android SDK. As Google Code doesn't let you mix'n'match licences, and importing a bunch of random code into my SVN seemed a bit crap, I've not included the original source in the repository. What I have done is supply a patch and a script to copy the code from your NDK installation, patch it up to use profiling, update the build scripts and then build the example. You'll need to have the "patch" program installed to get this working, or apply the changes manually. Since this is Android 2.3 only, I've only been able to test it on the emulator. Also the emulator doesn't like armeabi-v7a, so that remains completely untested - I'd stick to using APP_ABI := armeabi for profiling for now. Hopefully this'll clear up any misunderstandings like those mentioned in the comments on the last post I made on the subject. Full details are on this wiki page about getting the example working. Why are my textures not showing up on Android? What a disaster the initial week of "3D Space Game" has been! I recieved lots of 1 star reviews with vague hints about what the problem was - "doesn't work", "goofed up". When I realised there was a problem and added a note on the market asking people to email their problems before "down voting" I got a couple of very helpful bug reports. It turns out that on the Galaxy S and other larger-screened devices all of the textures I created from PNG images were not showing up. This meant that the control buttons and menu icons just show as white rectangles, completely unusable. The size of the texture is taken from the PNG, which I had carefully made sure was a power of 2. On my HTC Magic the textures show up fine, so I thought everything was working correctly. Problem solved. Let's hope for a reversal of the 1-star trend, eh readers? 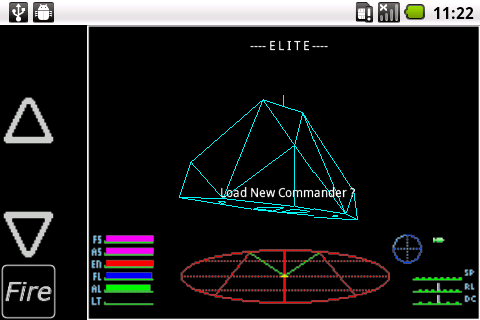 This is pretty much "Elite for Android" [edit - no longer available due to copyright concerns]. It's a port of a port of a remake of a fan-tweaked version of Elite. 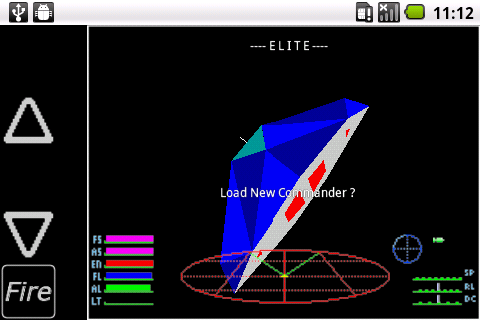 I first wrote this as a remake of Angus Duggans's Elite A for the GBA (Elite A being a tweaked version of the original Elite on the BBC Micro), ported that to the DS and now here it is on Android. It's not been without problems due to a severe lack of buttons on a phone. This version adds in "classic mode" to play the game without the Elite A modifications. I started the Android port back in October 2010 and it was more or less complete by December 2010. I've spent the months since then squashing bugs and refining the controls. Hopefully it will work on a lot of devices - I've been testing on 2009 vintage hardware - but there's no way to know for sure. Try it and let me know. In particular Samsung really threw a spanner in the works by not supplying a d-pad or trackball on the Galaxy S.
Most of these are due to the GBA/DS heritage, but none are show stoppers. I'll be updating with fixes as people complain :-) Also, the Nintendo DS and GBA "backports" of this code are not ready, so this is Android-only for now. There are still some outstanding problems that I need to fix on the DS, and the GBA code is further off, but I'm starting to get project fatigue here and need a change. Functions with no "calls", "self" or "total" are because they got called via JNI. The "draw_8x8_tile" call count there is accurate - it is called for each 8x8 tile on the screen in each frame. There are 32 x 24 tiles, and 2 layers of tiles. 32 * 24 * 2 * 288 = 442368, as expected. And the android_render_screen count is correct, since at 30 fps that is around 9 seconds of use and I only ran the game for a few seconds to check. More details on the android-ndk-profiler page, including a guide on how to use the library. Update: Since I wrote this post, bitbucket has added native Git support. Are you spotting a pattern here? Anyway, I'll leave the rest of the post here for the historians. When Atlassian bought bitbucket in September 2010 one of the first things they did was to allow single users an unlimited amount of private repositories for free. If you want to create an backup of your own code without making the source available this seems like a difficult offer to beat. I've been using it for some months to do exactly this. The only problem is that bitbucket uses Mercurial, what if you prefer git as your day to day version control? No worries as the Atlassians might say, you can bridge from Git to Mercurial using hg-git and a bit of fiddling. Here's what I did to set this all up, in case I forget later. # echo "did this once... not needed again"
This way I can use git for day to day hacking, and have a secure backup on a server somewhere for if the worst happens. I added Chaos 1.7 to the Android Market the other day. It's now passed 3000 downloads and I've had several emails and 5 star reviews from Chaos fans, so I'm pretty pleased that it's gone down that well. The only downer is that it really is for fans only, I just don't have any idea how to teach anyone brought up on modern games how to fight their way through an 8-bit world. Patience is needed, I guess. This release was the first time I'd linked to the brand new web-based Android Market. Until now I've always pointed to Appbrain. I think Appbrain has been struggling to keep up with the new additions that Google have made - like bigger icons, more screenshots and promo graphics. Appbrain has also had some down time and synchronisation issues, with comments being out of date or not appearing. I'm not sure what will happen to the 'brain. They have done a great service for Android users and it would be sad to see them disappear, but their business model was the classic snatching nickels from the path of an oncoming steamroller. I do hope they stick around, if only to keep Google on their toes. Saving the preferences was suggested in the comments on the Market. I hadn't added it before because I didn't know how to save stuff on Android. Turns out it is really easy and doesn't even need extra permissions. Actually, I'd already learned how to save for the next game I'm doing so a nice bit of "copy paste" later and it was done. Ah, good old copy and paste. The best form of code re-use. The performance improvements included not redrawing every single square every single frame, which for some reason I was doing before. If you spot any odd graphical artefacts because of this, do let me know. The attack sound fix was a silly non-interesting bug. I fixed it ages ago but also got a prod by email to actually release a version with the fix in place. I've updated the Nintendo DS and GBA versions too. These don't save the preferences, and I haven't tested them on hardware so let me know if they do not work at all. Apart from that, the DS and GBA are compiled with optimizations now (somehow this got lost in the last GBA/DS release) and should go faster. The GBA version was particularly sluggish last time round. Around the summer of 2010 I decided to switch from hacking around on the Nintendo DS to hacking around on Android. Android piqued my interest for the reaons I outlined at the time, but also because it has been changing at a breakneck pace especially if you compare it to the DS. I bought a HTC Magic off of ebay to test out my code. At the time the Magic had been out for a year or so, yet it was already considered out of date! 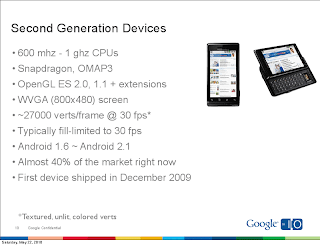 To everyone's surprise Google updated the version of Android running on the phone to the very recent Froyo 2.2.1 at the end of December 2010. Meanwhile, Nintendo only updated the firmware on the DS to block flash cartridges that allow homebrew. From a fun-filled hacking point of view Android is a more entertaining prospect. The distribution method - upload to the Market, and users are automatically notified of updates - is really great. As a user it's always nice to see applications that have been updated and to read the "recent changes" section to see what's new. As a developer, there's no need to advise people that you've released a bug fix. You just upload a new apk file, update the recent changes section, and you're done. Here are notes on some of the things I've learned while coding for Android. When I wrote about my switch to Android I said "coding for Android feels like cheating. 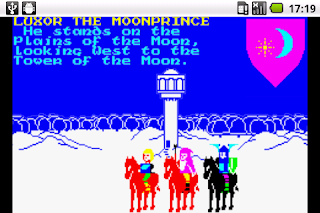 The emulator is highly accurate". I must have been viewing the new (to me) platform through rose tinted glasses there. The reality is that the emulator became useless as soon as I started using OpenGL to render Chaos. On hardware I was getting close to 60 frames per second (FPS), but on the emulator I was lucky to get above 10 FPS. This made testing on anything but hardware impossibly slow. Fortunately I had my experience with emulators from my DS days and I knew that the best way to test embedded code is to get that code running natively on desktop Linux. The majority of the time I compile and test the Linux build, only occasionally switching to Android to check things still work. All the real gameplay testing I do is on hardware though, as the feel of using a touch screen is nothing like the feel of clicking things with a mouse. There is an inaccuracy in the OpenGL emulation that could catch you out if you never tested on hardware. On the emulator you don't need to call glTexParameterf and set GL_TEXTURE_MIN_FILTER and GL_TEXTURE_MAG_FILTER to GL_LINEAR or similar, which sets up the texture "mip maps". If you fail to do this on a real device, your textures will only show up as white polygons. A game can run well on the phone you have tested with, but this doesn't guarantee anything. Soon after you put the game on the Market, you can be sure someone will post a 1-star review stating that the game doesn't run on their particular Android device. The Market dashboard for developers has a tab for "Error reports" that never shows anything, but it would be nice if it somehow gave a logcat dump of crashes and force closes. If you want people to get in touch with you instead of posting a 1-star review, you really need to explicitly state that on your game's description. Otherwise you will never get to the bottom of errors. I think the instant gratification of giving a free game 1 star trumps the hassle of getting in touch with the author. It's perfectly understandable really and something other people have noticed with free app users vs paying customers - people using free things actually have higher expectations! The SoundPool class, which is used to play back sampled sounds and seems ideal for games, will randomly crash on some hardware platforms and some versions of Android if you use MP3. MP3 is one of the supported media formats, but there are some weird issues on some phones. For example Chaos crashed on an HTC Hero, which has almost identical hardware to a Magic, running similar versions of Android (2.2.1 "official" vs 2.2.1 cyanogen mod). Random internet forum posts show that OGG files work better, but that WAV files can crash if looped. When I switched from using MP3 to OGG the crash reports I was seeing dried up. When managing the life-cycle of a native application, strange things can happen with your OpenGL context. According to the documentation all you need to do is call the "onPause()" and "onResume()" methods of your GLSurfaceView when the user switches away and then returns to the game. However, on Android 1.6 at least you can get in a state were the "onSurfaceChanged()" method is not called again, so you don't have a hook to setting up the correct GL state. This seems to have gone away with Android 2.2, or at least the game's already set-up context is not ruined in the same way. On 1.6 I'd seen Chaos have a wrecked graphical display after the phone went to sleep, but since the 2.2 update this hasn't happened to me. A few weeks ago I wrote about getting a good frame rate on Android using the NDK. On my HTC Magic I was getting nearly 60 FPS with that approach. Well, it turns out that new devices are limited to 30 fps. So if I assume a 60 fps rate (as seen on the DS), I would make everything run half as fast. The solution is to limit the frame rate to 30 fps even on "faster" (older!) hardware. An advantage to running at a lower frame rate is that it saves the battery, but it still seems a bit backwards to me. Almost every time I've posted a new version of Chaos it has received a few new ratings on the Market. I imagine that this is because people download the game then go off and play it, but forget to go back to the Market and rate it. When a new version appears, they return to the Market and now they know it's amazing (!) so rate it 5 stars and install the update. Don't abuse this phenomenon though. If you upload lots of minor versions with no user-visible changes, people will quickly tire and start rating your game worse. I saw this effect in a few comments for the game "My Paper Plane 2", which had dozens of minor updates with no new features. One reviewer said "Minus 2 stars for frequency of updates and no explanation." I don't know if the issues I've had are related to the ADT plugin, communication with the emulator or Eclipse itself, but the integration of the whole Android SDK + Eclipse IDE is flaky. Often the text editing GUI hangs for 30+ seconds when you type a "." and auto-complete kicks in, with the CPU grinding away at 100%. Other times Eclipse fails to connect to the emulator to debug or upload new apk files, and you have to restart the emulator. The emulator takes minutes to restart, it is slower to boot than even the hardware phone. Then there's the built in logcat view that will miss messages if they pass by too quickly. The command line adb logcat equivalent will show you what you missed. I haven't tried the GUI builder nor XML editor, so cannot comment. At least in the last ADT version opening the XML layout files no longer causes a NullPointerException. I have a Vim command :AdbReinstall that loads the APK file onto the emulator or device. I can build using :make. It's great that the Android SDK is flexible enough to allow me to do this, there are even instructions on how to set parts of it up in the official documentation. I doubt it is as easy to do for iPhone or Windows development. One interesting characteristic of the Android Market that has matured a lot in the last few months is the way applications are filtered based on the hardware features they use. As an example, Chaos uses the touch screen and is compiled for arm-eabi. The touch controls are actually optional - if you want you can just about get by with the trackball or d-pad and the buttons - but originally I didn't state that in the manifest. This meant that Chaos would not be seen on x86 Android devices (are there any?) nor on devices without a touch screen (examples?). This information was all auto-detected by the Market server - I didn't have to mention anything anywhere. Once I decided that Chaos was usable without a touch screen, I added a "uses-feature" section to the manifest stating that the touch screen was optional. There may be hardware fragmentation, but this part at least is handled in a quite developer-friendly way. The next game I'm doing will use the compass and accelerometer for tilt controls. As far as I can tell, I won't have to state anything in the manifest to avoid disappointing folk with phones without these features, the Market will add the filters automatically (we'll see!). The lack of physical buttons on Android means that several genres of games are not really possible, or you need to add a virtual d-pad and buttons on screen that react to touch. Unfortunately there seems to be a horrible bug in the way Android processes events when the user leaves their finger on the touch screen. When you hold your finger on the screen it leads to the touch input completely swamping the CPU to the detriment of the game's frame rate. The onTouchEvent method is called every 10 milliseconds with what amount to non-events, such as subtle changes in pressure detected by the screen's sensor. Even if all you do in the event handler is store the touch position and type, to later process in the main thread, the application will lose out on framerate as the touch event thread is given priority. Now I may be doing something wrong here, but several similar-looking questions on stackoverflow.com seem to agree with my experience. There's a bug report on the Android project that has been fixed in Gingerbread. Sadly the lower-end devices that really need this fix will never see Android 2.3, at least not officially. Meanwhile, all the "sleep" workarounds proposed don't seem to make things any better. There we are then. Android has some issues when compared to a closed hardware platform like the DS. You can't be 100% sure that what runs on your device will run on everyone else's. This is scary, but then there's a good chance your game will work OK. And it will probably work fine with different Android versions, screen resolutions, types of processor and hardware features. I think for free games, or if you have a free demo for people to try before they buy, then this is an acceptable compromise. After my albeit limited experience with this, I understand now why a limited hardware platform is going to be more popular for games. If you compare the amount and variety of games released on the Apple hardware (iP*d/iPhone) to Android, the difference is huge. Giving stuff away for free is obviously not too cost effective (having embedded adverts can mitigate this, but adverts are only viable on huge hits) and creating a free demo takes time away from creating the core game. So given the choice, developers would rather have people pay for the game, right? If you expect people to pay for your game, then you'd like to think it works on their device. When you write for a platform with a limited range of hardware devices, you only have to test on those devices. With the DS, the DSi and DSiXL are identical platforms - Nintendo is very careful about backwards compatibility. You don't need need to test GBA games on a DS to check they run correctly, for example. These things just work. Now if we consider Android, there's no way any regular developer could test all possible devices. The best you could hope for is to test on maybe some representative devices. If you support old versions of Android, a first generation HTC phone. Then maybe something like a Nexus One, then a Sony phone as they seem to have quite different Open GL hardware, maybe a Motorola and a Samsung due to their popularity. Factor the tablet-sized Android devices and we're talking quite an investment. This doesn't include the various Android versions that may run on these devices - you probably have to target a lower API level and hope not to slip up and include newer Java API calls. Those would result in run time errors on older versions than your target API. When you write a game primarily in C it's harder to slip up like this, but still possible. For example, getting the name of the SD card directory to write to changed a lot in Froyo. Given all of this, the openness of Android is definitely off-putting if you're only in it for the money. As a tinkerer into this stuff, it certainly keeps me on my toes. Maybe the new Gingerbread SDK with its "look ma! no Java!" 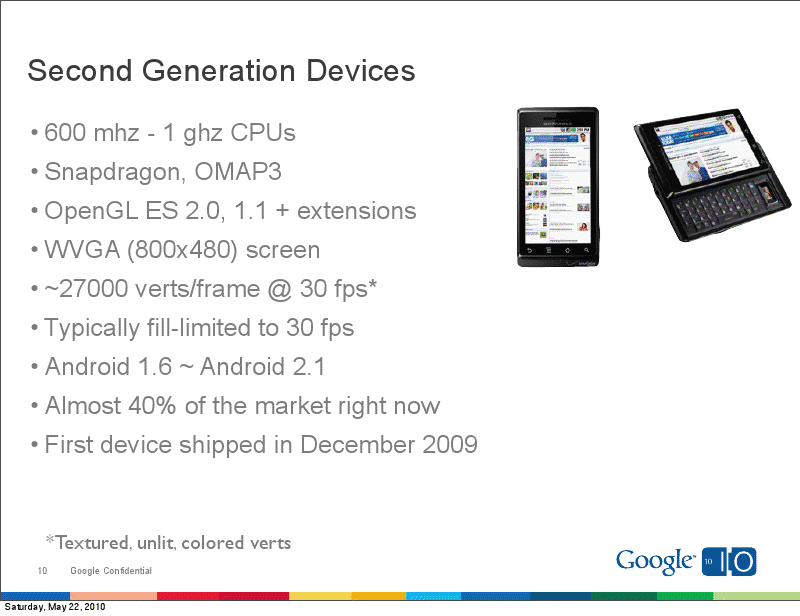 C-only Activities and touch screen bug fixes will lead to more Android 2.3-only (paid) games. Especially if the Sony Play-not-station phone runs this version and has any kind of popularity.